Preprocessing has proven important in enabling efficient Boolean satisfiability (SAT) solving. 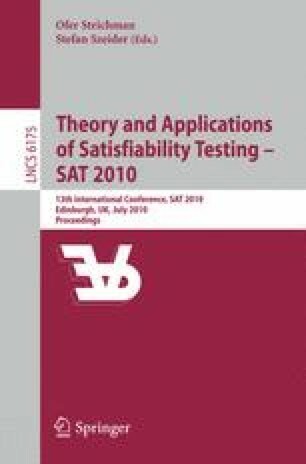 For many real application scenarios of SAT it is important to be able to extract a full satisfying assignment for original SAT instances from a satisfying assignment for the instances after preprocessing. We show how such full solutions can be efficiently reconstructed from solutions to the conjunctive normal form (CNF) formulas resulting from applying a combination of various CNF preprocessing techniques implemented in the PrecoSAT solver—especially, blocked clause elimination combined with SatElite-style variable elimination and equivalence reasoning. First author financially supported by Academy of Finland (grant 132812).